Doors open at 1:30 PM with Jim Morris playing from 2 – 5 PM. $15 per person includes lunch. BYOB and a chair. 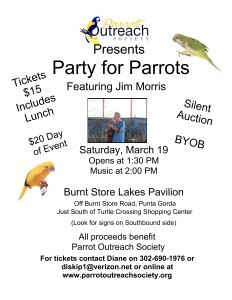 Proceeds benefit the Parrot Outreach Society of Punta Gorda.